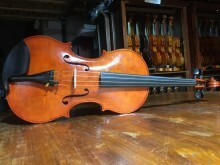 This is a great sounding16" viola. The intensity of sound is unmistakinglycoming from a very good Cremonese workshop. In thios case it comes from the workshop of Roberto Cavagnoli who has emerged as a popular Cremonese luthier. Click the button below to add the Italian Viola made under the guidance of Roberto Cavagnoli 2017 to your wish list.